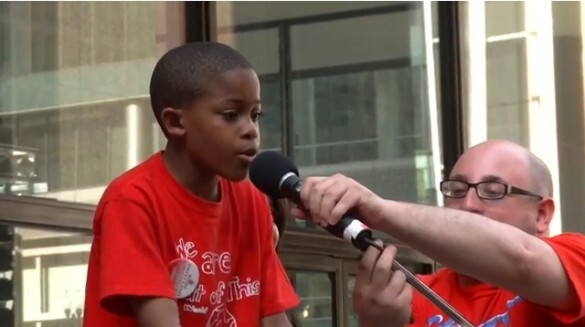 Third grader Asean Johnson openly calls the school closings racist at a rally on Daley Plaza this past Monday. This past Wednesday CPS finalized its decision to close 49 of the the city’s public schools, forcing some 40,000 students to abruptly change school environments, or “welcome” huge new populations of students into their already undersupported schools. This has come on the tail end of a long year of activity–the Chicago Teachers Union strike in the fall, CPS’ announcement of the largest set of school closings in the city’s history, and the subsequent school hearings that CPS held to listen to the grievances of effected communities. As the reality of school closings becomes all the more real, as does the trauma and violence they will likely cause for oppressed communities, there are some important moments from the last year worth revisiting–ones that remind us that generations of political memory on the part of oppressed people in Chicago are what have made certain battles over the past year successful, and need to be further relied on as these battles continue. At an event held by the CTU in conversation with activist Lois Weiner back in early February, Eric Gustein, an educator and member of the Grassroots Education Movement, reminded the crowd why the initial strike in the fall had been effective in changing the narrative around education in the city. Whereas many teachers unions around the country have traditionally and continue to function as litigious buffers between educators and the communities with which they work, the Chicago Teachers Union fought actively over the course of years to build a base of support amongst the neighborhoods, students, parents and families of their schools. Leadership consciously connected their struggles as workers in the public sector to the larger issues being faced by the communities in which they work–from gentrification and housing to violence and police brutality. When the time came to push back against CPS for a fair contract, the CTU organized to fight for the conditions that would make learning possible for their entire school communities, not simply their own needs as employees. The strike was successful, Gustein argued, not simply because the CTU had a base of support in the community that other strikes had not, but actually because the CTU had learned its strategy from the community. The union’s active involvement in oppressed communities had taught it the need for a full-scale movement that addressed a network of issues rather than “agitating” around one isolated problem, and that valued resistance rather than litigation. The reality that Black, Brown, poor, working and immigrant communities have been the leaders of this current struggle in both seen and unseen ways, has manifested itself in more than just the tactics of the union. After its original announcement that over 100 public schools could be closing in the 2013 school year, CPS held hearings with each of the major districts, ostensibly to connect with communities and listen to their needs. In reality, these hearings were staged productions (funded in part by the Walton Foundation) in which CPS officials refused to speak or answer any questions, but instead expected the effected school communities to plead the case for keeping their schools open. At many of these hearings, especially the ones in districts with more white and middle class school community members, this setup worked. At hearings I attended, schools boasted their high state test scores, trotted out their volunteers and corporate sponsors, and had parents and students beg CPS to keep their schools open. Some even went as far as making recommendations about which schools should close in their place, or offering themselves up as willing and able to “welcome” the student populations from closing schools. It was at hearings with high numbers of oppressed families and oppressed educators that turned these tactics on their heads. All over the South and West Sides, school hearings were shut down by students, educators and parents who had endured these shams for generations. Many Black and Brown communities rejected CPS’ proposals and instead turned the hearings into their own rallies for community autonomy, protest and support. Understanding that CPS had already made up its mind about how it was going to proceed, recognizing the hearings as a joke, and transforming them instead into an opportunity for further community organizing, was a political decision made by oppressed communities before it was made by the larger struggle. While the participation of families, students and parents has been overwhelming in certain areas of the fight, other schools and districts have had a hard time involving the community in organizing around school closings. Yet what continues to be read as lethargy and indifference, I believe, needs to be understood as another form of learned political awareness held by oppressed communities. I am currently observing at one of the closing schools, and the battle to get parents involved has been a long one. The parents I have spoken to in my brief time there have never expressed indifference or apathy. On the contrary, it is their deep distrust for the public sector, the local government and the judicial system that makes taking a bus to lobby the state capitol or spending an afternoon rallying at the mayor’s office seem like a waste of time. Many oppressed communities have dealt with decades (if not centuries) of being totally unrepresented, unrecognized and ignored by their government by organizing themselves, placing their energy in places outside schools, elections, and other systems that have caused more damage than positive shifts for their communities. While I certainly hope for the collective efforts across communities to oppose economic marginalization of all our communities, I also believe that many oppressed people already see organization outside of the structures in place as the most feasible way to achieve such a goal. This should be understood as a form of political advancement learned through generations of mixed outcomes from those structures, and a knowledge of the true function of these systems that other communities may learn volumes from. As these struggles continue, not as one but as a host of connected battles, from which points will our support, our stamina and our vision forward derive itself? When an event like the school closings has proven irrefutably that the state has its own agenda and holds no interest in acknowledging the needs of oppressed communities, how must our tactics necessarily change?